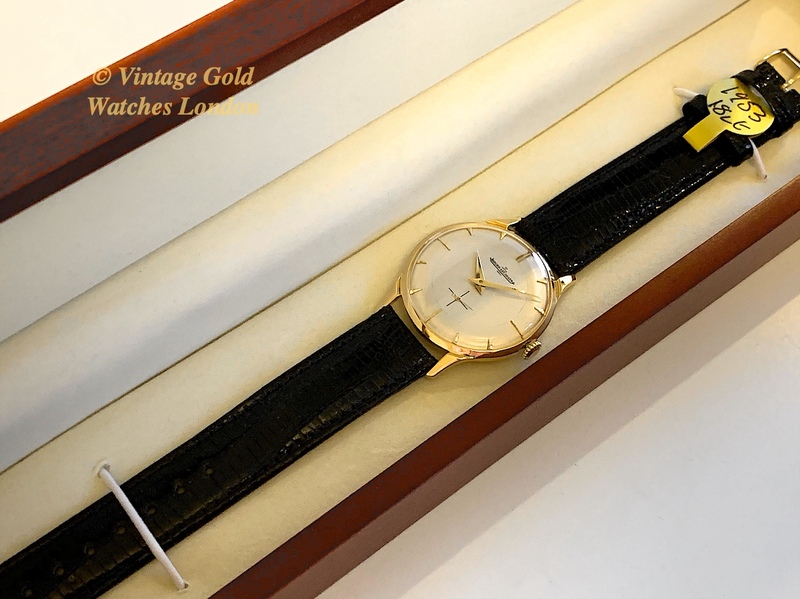 Here we have a most elegant example of a gentleman’s classic 1950s, oversize 18ct dress watch from Jaeger-LeCoultre in fully restored condition. This watch has a very highly regarded Jaeger-LeCoultre movement which is very accurate and reliable, making the perfect watch for special occasions or with care, everyday use! The classic Silver dial with Yellow gilt raised numerals and arrowhead hour indices is matched by the original Yellow gilt ‘Dauphine’ hands. Simply signed Jaeger-LeCoultre and ‘Geneve’, with a subsidiary seconds dial at 6 o’clock, the overall look, as with all vintage Jaeger-LeCoultre, is one of original, classic, simplicity and elegance. The lens is new, having been replaced as part of the restoration. This is the original dial which has been restored to the very highest standards by the UK’s foremost dial restorers. The watch has its all original ultra-high quality, 17 jewelled, Calibre P480/C hand-wound movement. This movement is very highly regarded for being particularly accurate and reliable. The movement has been fully overhauled and serviced by our watchmaker. This involves complete dismantling to each of its component parts, ultrasonic cleaning, microscope inspection and replacement of parts as required, only with new JLC originals, then careful assembly and oiling ready for final testing and careful calibration. The watch is now running perfectly having been calibrated and timed at +11 seconds per day which is outstanding for any watch of this age. The watch has a runtime of 43 hours from its fully wound state which shows the movement is particularly strong and running and well within expected parameters. It is now ready for many more decades of faithful service and we are therefore more than happy to offer this watch with our 12 months’ warranty* and to assist with servicing again in around three years time. The movement is signed Jaeger-LeCoultre Co and ‘Fab Suisse’ with the calibre number P480/C and with the movement serial number 925390, making the year of manufacture 1953. The 18ct yellow gold watch case is in excellent condition, having received a very gentle and sympathetic clean and polish, although the watch has obviously been very well cared for, as there are no dings, scratches or marks visible to the naked eye. 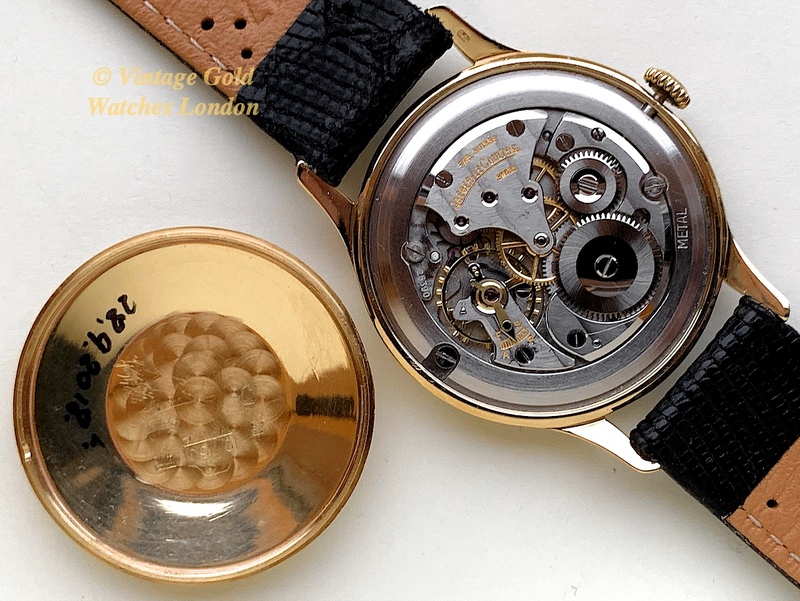 The case is the much rarer oversize 35mm diameter, not including the crown. The beautiful ’40s/50s teardrop lugs are also an attractive feature and give the watch a greater presence. The case-back is properly marked as expected, with Swiss 18ct hallmarks, ’18ct 0.750′, ‘SWISS, and signed “L&C” for LeCoultre, with an external case serial number 643578 visible on the case-back. This number is clear, indicating the watch case has not been over polished. Also, importantly, the case-back is of full thickness and has never been engraved. As ever, our normal advice applies: Vintage watches should be kept clean and dry at all times. A new, high quality Brown Alligator strap has been fitted, along with a plain gold plated buckle. However, if a different colour or style of strap is preferred, please let us know and we will do our best to oblige free of charge. We carry tan, conker, dark brown and black in stock in plain padded leather, crocodile skin or lizard skin, but can also obtain most types and colours from our partners at ‘Watch Obsession’ within 48hrs. Please take a look at their huge range of 19mm straps if you wish. Although there are no original papers with this watch, the reference numbers, markings, signatures and hallmarks are all correct, dating this watch to 1953. Detailed particulars will be included with our purchase receipt and 12 months’ warranty*. A separate insurance valuation for the replacement value of this watch will be provided at the time of sale along with our unique ‘Lifetime Authenticity Guarantee’ which states: “If this watch proves to be anything less than totally authentic, or not as described, Vintage Gold Watches of London will offer you a full refund at any time”. As with all our watches, this watch will be sold under our 14 days no quibble sale or return policy. This is exactly the kind of watch we love to find, restore and offer for sale. It is many more times more stylish than the modern equivalent watch and even though it is now a half-century old, it is still completely fresh, reliable and practical to wear as your everyday watch should you wish. Mostly it’s a thing of beauty some would say, ourselves included, a work of art, from one of the most prestigious names in Swiss watchmaking. Should you wish to view it this way, it is also an excellent investment and heirloom piece and as each year goes by and the world market for vintage gold watches grows ever greater, limited supply and high demand from the Far East, means prices will climb ever higher! Please note – Vintage watches should be kept clean and dry at all times.